As part of our digital and technology two-part special, we are focusing on what grants are available to UK charities. In last week’s article, we covered the TT-Exchange donation program that has some amazing grants for Windows server licensing. This week we are taking off the “IT hat” and focusing on digital marketing and a grant that is available from Google. It’s called the Google Adwords Grant. And entitles UK charities to a whopping $10,000 per month of free advertising on the Google Adwords platform. If you search around the web you’ll find lots of info on if your organisations can apply for the grant and how to apply. We are however going to be focusing on the practical application of the grant and how it can be successfully used. To be brief Google Adwords are the adverts that you see when you type a search into the google search bar. 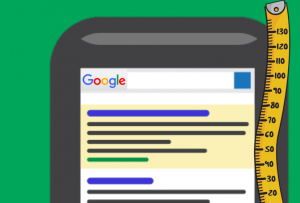 Most advertisers pay to google when someone clicks on their advert. The grant allows you to bypass the charge for that click and allows up to $300 dollars a day of “free clicks”. As of 2016 Google as now implemented 4 adverts at the top of the search page. What this means is that there’s a full page of adverts on a mobile device before you get to the organic SEO results. Studies have shown that more people are clicking on the adverts so it’s an ideal time to take advantage of this Google Grant if you are a UK charity. Now on to the practical use of the grant. We believe there are two main uses for the grant. Raising awareness of your charities cause and promoting fundraising events locally. Example 1: Raising awareness of your cause. In this example, we’ll take the organisation Inspire. They assist people with learning disabilities and are locally funded by the council. The are a number of the people they support which are on the autistic spectrum. As such we would guess Inspire would want to raise awareness about what it means to be autistic. The first steps in the process are getting your website up to scratch. You want to link from a Google Adwords ad directly to a specific page on your website. This is where a lot of companies fail. They simply link directly to the homepage which will not be ideal from the user’s point of view. They specifically came to google to help answer a question about a particular topic for example “what is autism”. As such you should have a page dedicated to this topic and link directly to it from the Google Adwords campaign. Of course, we are only guessing what people might be searching for in Google. This is where the Google keyword planner comes in useful. It allows you to do research on what people are searching for within google around a particular topic. You can login to the google keyword planner from here once you’ve been set up with a google Adwords Grant. 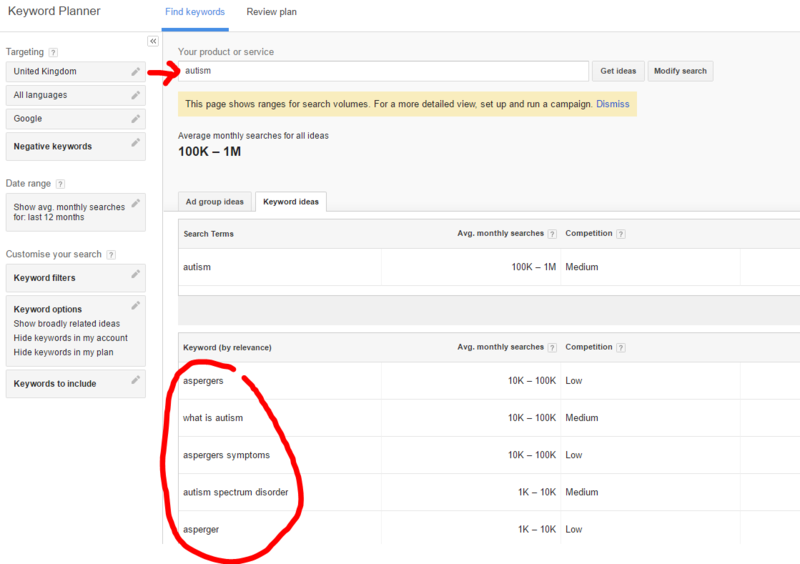 Use the keyword planner to get ideas on content and what topics you can be targeting. Not only will the google keyword planner give you topic ideas for your on page website content it will also bring back a list of “keywords”. These are the search terms people are using. It also reports on the volume of keywords on a monthly basis. Ideally, you want to target 3-5 keywords generating at least 1000 searches a month. Now that we have a topic ideal and keywords it’s time to produce some relevant content on the subject. What I would recommend at this stage is to have the user’s search query in mind. They are probably wanting to an answer to a question so the more helpful you can be in the content the better your chance of success. You will also want to include some form of call-to-action in your content, for example, a social follow or an email sign up. Raising awareness is the obvious goal of this strategy but if you can also gain an extra email address then it’s a win-win situation. In this example we’ve only covered one topic area (autism) however, there are probably many topics you can raise awareness on. Once you’ve got all these topics planned out and content published around each one available on your site it’s now time to utilise that google Adwords grant. We’re note done yet, however, one of the key factors to a successful Google Adwords campaign is not only having relevant content with a call to action. It’s also crucial that you monitor the campaign, see what is working and refine the campaign. This is where IT Rockstars can help we have a unique system that can increase relevancy in your Google Adwords campaigns and get real results. Can you walk on fire? We are aware that most 3rd sector charities have fundraising events and they use the medium of social media (facebook/twitter/Instagram) to promote these events. In this example, we’ll be discussing a real-world event that took place here in Aberdeen and how Google Adwords was used to gain more sponsors of the event. Again in this example the charity in question is Inspire. On the 5th of November every year there’s a fireworks display that takes place down in the beach front in Aberdeen. For the last few years, Inspire has run a sponsored firewalk to coincide with the fireworks event. This is a sponsored firewalk that raises funds for Inspire. In collaboration with the marketing manager we successfully implemented a google ad words campaign around this event. The first steps were getting our creative thinking hats on and to figure out the types of searches people might be doing in relation to the fireworks display being held at the beach. With this basic list of keywords, we carefully crafted a unique web page that answered the questions in the searcher’s intent as well as highlighting the opportunity to become a sponsored firewalk. It was then time to get work on the actual google Adwords campaign. For this, we deployed radius targeting within the campaign which allows you to be very specific as to the geographic locality of the searchers location. This is a crucial step in having a successful AdWords campaign otherwise your ad budget would get eaten up in a matter of hours as the default location is the whole of the UK. We’re not done there, though. There’s also ad scheduling that allows you to show your google ad word between specific dates. In our example we wanted the advert to stop displaying on the morning of the 5th of November as all the sponsored firewalk numbers had to be confirmed with the organisers prior to the event. You can also schedule to stop the adverts being shown at certain times of the day which is also useful. We usually find that a number of searches between 10pm – 6am are not worth bidding on. This free’s up to the daily budget for busier times of the day. This is particularly a good time if you are running a business and only can answer incoming leads on the phone within business hours. The final step once again in this whole process was having a relevant call to action in the webpage content that would capture leads and possible sponsors of the event. We did this by again implementing an email capture form & the option of filling in a sponsor for using the great web based forms provided by Wufoo. To conclude we hope you found this information useful. Whilst it’s aimed at the 3rd sector & charities businesses also can benefit hugely from an optimised Adwords Campaign depending on the industry. Remember to start small and measure your success with Adwords. It’s also worth noting that this strategy for online digital marketing is not a quick win and Adwords campaigns that have a tremendous impact are optimised over the course of several months. This includes refining keyword lists, applying negative keyword lists and looking deep into the AdWords reporting system to find out where the winning keywords are and creating separate campaigns for further optimisation. If you would like further advice on Google Adwords please fill in this [ninja-popup ID=501] form [/ninja-popup] to arrange a call with IT Rockstars.